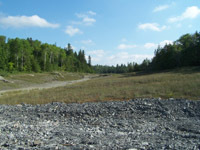 The Nova Scotia site, also known as the Dominion Reduction site, is located on the east side of the east lobe of Peterson Lake. In 1968 and 1969 the east lobe of the lake was drained, and almost 55,000 tons of tailings were removed for reprocessing. The new tailings were deposited in Crosswise Lake, and the amount of tailings currently in Peterson Lake is unknown. A significant amount of tailings are also on land at this site, with a dam constructed to contain the tailings. In the early 1990s a breach in this dam was repaired. Prior to this, tailings would flood across the road and into the lake during heavy rainfalls and spring runoff. These efforts to repair the dam were not adequate, and the dam again breached. In the early 2000s, the dam was again reinforced. In addition, some of the waste rock and debris from around the site has been cleaned up, and a parking lot was established when the site became part of the Heritage Silver Trail. The on-land tailings at the site are largely vegetated, though this is belived to be natural, as there have not been any efforts to establish vegetation on this site as part of reclamation efforts. Vegetation was already established on these tailings in the early 1990s. Further monitoring at this site could include sampling of any water seeping through the dam, to determine contaminant concentrations in this water and assess whether these tailings are a source of arsenic and other contaminants.